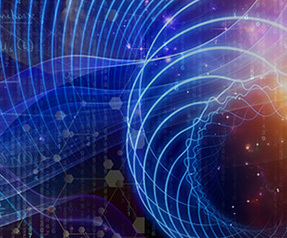 As many pathways of knowledge are now coming together, we wish to affirm a common basis for science, medicine and spirituality -and that common basis is a higher consciousness connected with what we call the "embodiment of Light" or the Light Body. We are an open-ended system, not limited in our ability to work only with the biochemical body and the psychochemical body, but capable of expanding those pathways into what we call the eka body of many plus and minus relativities, both in and beyond this physical form. The axiatonal lines are part of a fifth circulatory field extending not only through your cells with its microtubules but beyond your body. You are a walking Tree of Knowledge, and as you go further up to the neurocircuitry, you realize that you are a biotransducer processing the thought-forms of energy from the universal mind, the universal consciousness, the universal "I AM." The human body is but one embodiment of several energy vehicles. In that sense, we are part of an electromagnetic energy system, as known by modern science, but one that is subordinate to the circulatory pathways of other fields and levels of evolution that reach throughout the stars and beyond. More importantly, there is a type of "garden" within the mind's eye, which allows us to interconnect with the energy fields of the body to become conscious biotransducers, aware that we are continually tapping into the energies of the universe. Here we recognize our multi-dimensionality: we are not only an electromagnetic body, but we are also an epi-kinetic body of sound vibration and a body of many plus and minus relativities, the eka body (See The Five Bodies, J.J. and D.E. Hurtak). We have, in essence, what the ancient Chinese called the "five Buddha bodies". When we can actively work with them we can achieve higher levels of consciousness. We are, in effect, a vehicle of many vehicles, a system of many bodies working on many levels. We also now know that sound is all around us. The black hole in Perseus* is recorded to be sounding A# at 57 octaves below "middle C". This is not the only sound in space; scientists have recorded eerie sounds from the aurora borealis around our planet, revealing that everything is vibration. And although it is difficult to perfectly equate the frequency spectrum of cells and molecules to that of sound, many attempts by scientists and artists have taken us one step closer to understanding that we are a symphony of creation. Yet there are benefits from genetic engineering that can be seen in adult stem cell research. Seen from the standpoint of modern "regenerative medicine" (which accords with electromedicine in The Keys of Enoch®), new studies in the United States are showing, in conjunction with stem cell research, how fingers and toes can be re-grown and how spinal systems that are broken can be fused anew. This regrowth takes place because there is a matrix behind the physical body connected with the axiatonal lines. So we are seeing a whole new area of medicine emerging with adult stem cells which confirms the higher matrix of life.